These ceremonies have the strength of hundreds of years behind them. They include words your parents and grandparents spoke to each other, cementing their love. Traditional weddings may be either religious or non-religious. 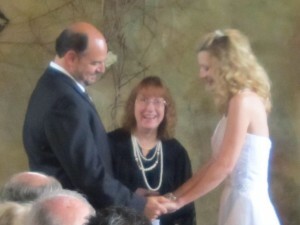 Modern ceremonies are meaningful reinterpretations of weddings of the past. They are often shorter and will omit some standard ceremony sections. These ceremonies do not include any reference to God, Christ, or other religious beliefs. They do not even use words such as “sacred, or blessing”. Religious ceremonies come in several varieties. The first option usually mentions God at the ceremony’s beginning and end, perhaps blessing your rings, while all the remaining sections are non-religious. The next choice is fully religious and includes God and prayers throughout. Weddings derived from various faiths, including Catholic, Jewish and Protestant, are also available because Justice Maryann has studied comparative religious. With deep respect for your individual religious traditions, Justice Maryann will design with you both an interfaith wedding ceremony beautifully blending beliefs. Vows are the most personal promises you will ever make to one another. Justice Maryann offers you an extensive selection of Vows. Of course, you are always welcome to write your own Vows if you prefer. Ask her what are the three most important elements composing a vow. Justice Maryann shares with you a comprehensive library of Wedding Readings. These words will radiate your heart’s message to your Love and inspire your guests.